Like most parents, Taschana Taylor was excited to bond with her newborn daughter, Grace. But after an emergency cesarean section, Grace was admitted to a neonatal intensive care unit (NICU) where clinicians could monitor her and provide care. 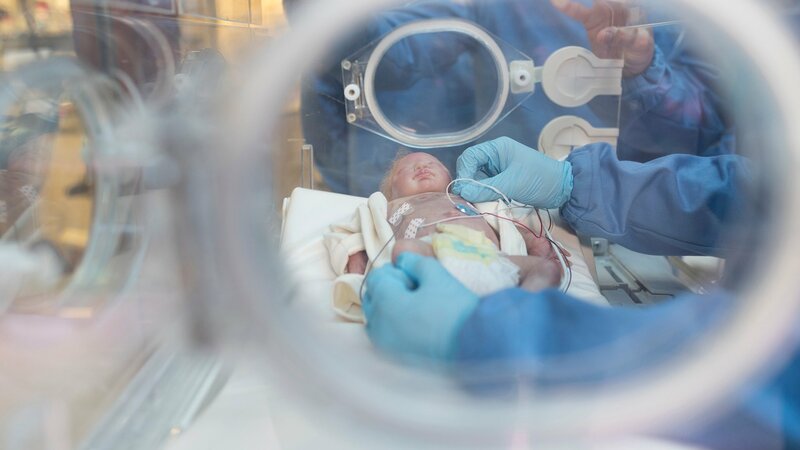 NICU patients, like Grace, have electrodes placed on them that are connected via wires to machines that monitor breathing, blood pressure, blood oxygen, heartbeat and more. These wires, though they ensure a newborn’s health and safety, constrain the baby’s movements and pose a barrier to physical bonding and parent-baby cuddling. “Trying to feed her, change her, swaddle her, hold her and move around with her with the wires was difficult,” Taylor said in a statement. Within a few years, researchers hope to replace those wires with a pair of wireless sensors developed by an interdisciplinary team that included materials scientists, engineers, dermatologists and pediatricians at Northwestern University. The paper-thin device is composed of biocompatible, soft elastic silicone that embeds a collection of tiny electronic components connected with spring-like wires that move and flex with the body. Rogers worked with Yonggang Huang, a stretchable electronics and theoretical mechanics expert, to develop an optimal design. The dual wireless sensors monitor babies’ vital signs – heart rate, respiration rate and body temperature – from opposite ends of the body. One sensor, measuring 5 centimeters by 2.5 centimeters, is placed on the baby’s chest or back, while another, measuring 2.5 centimeters by 2 centimeters, is wrapped around its food. This allows clinicians to monitor an infant’s core temperature as well as body temperature from a peripheral region. Currently, there isn’t a good way to collect a reliable blood pressure measurement as a blood pressure cuff can bruise or damage an infant’s skin. An alternative to a blood pressure cuff is to insert a catheter into an infant's artery, which can be difficult and poses a risk for infection, clotting or even death. With the wireless sensors, physicians can measure blood pressure continuously. The transparent sensors can also be worn during X-rays, MRIs and CT scans – an advantage over the current wire-based system. “Wires are not just a physical impediment to interacting with the baby but also disrupt imaging if left in place,” said Dr. Amy Paller, dermatology department chair at Northwestern University. The wireless sensor communicates through a transmitter placed underneath a crib’s mattress. Using radio frequencies the same strength as those in RFID tags, the antenna transmits data to displays at the nurses’ station. Although it can be sterilized and reused, the sensor is cheap enough (about $10) that it can simply be discarded after 24 hours and replaced with a new one to eliminate any risk of infection.